Looks great in my hallway! This stunning 2-light Wall Sconce only uses the best quality material and workmanship ensuring a beautiful heirloom quality piece. Featuring a beautiful French Gold finish and finely cut premium grade clear crystals with a lead content of 30-percent, this elegant wall sconce will give any room sparkle and glamour. Beautiful matched the chandelier I purchased on overstock perfectly with the Italian Elegance 5 Light French Gold Finish and Clear Crystal Traditional Chandelier Medium 18" x 19" that I also purchased from overstock. Looks so expensive! Looks beautiful! I am very satisfied with this product! They were hung up immediately and look so pretty. Great price and great quality! "Is this a center mount or does it mount on top & bottom or each side?" "I am worried that the base is made of aluminum which is a very light metal and that it will not hold up, keep it's color from peeling and make it look cheap close up in person. Is the aluminum better than I am thinking since there are no reviews yet?" Hello Valued Customer, thank you for shopping with us. This designed and manufactured to last for years. I would be confident that you get years of use from the sconce. Have a great day. "Do you have anything similar in price and style to the sconce on this page? Any finish will do because I'm painting it anyway. Would prefer a two light, but.need one that is 10 in wide or less. " Hello Valued Customer, ITEM# 17615263 may be an option. 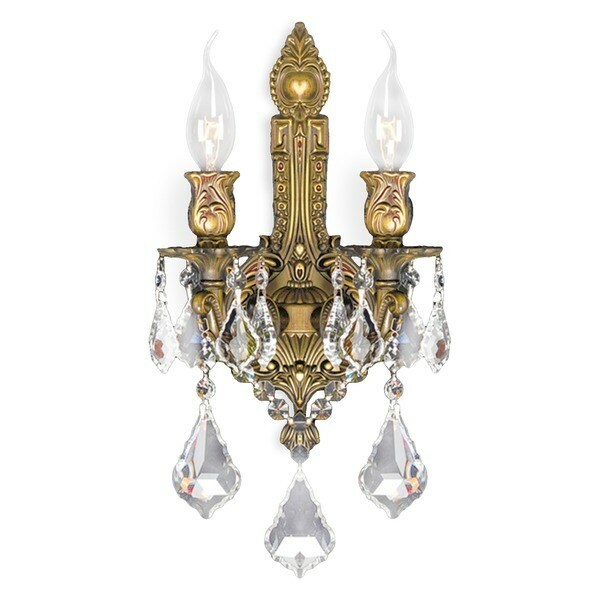 You're welcome to use our sort methods to assist in finding your ideal sconce here: (http://www.overstock.com/Home-Garden/Sconces-Vanities/11254/subcat.html). Thanks for shopping with us! "What is the exact width of the sconce on this page. It just says less than 16 in." Hello Valued Customer, this sconce measures approximately 13 inches high x 12 inches wide x 5 inches deep. Thanks for shopping with us!